On December 1, 2016, I had blogged on “Something Has Gone Seriously Wrong Somewhere” (http://yesheydorji.blogspot.com/2016/12/most-of-my-friends-have-started-their.html). I moaned about our domestic electricity tariff being way out of the reach of most of us poor fellows in this country. Yet again, my time for anguish is here. 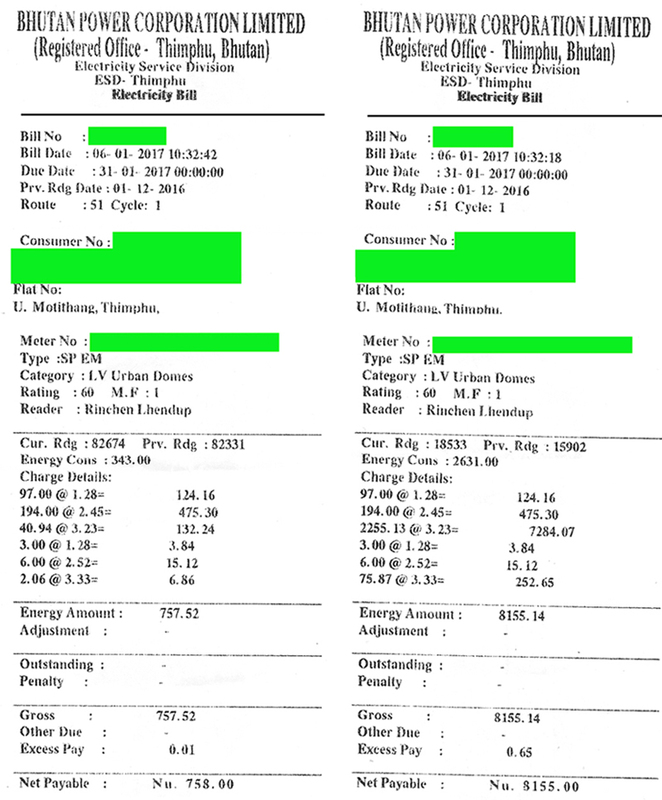 On the morning of 6th January, 2017 I got my electricity bill for the month of December, 2016. 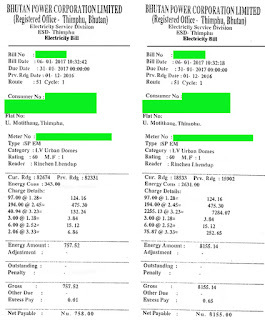 The two bills (don't ask me why I am getting two bills) collectively amounted to nearly Nu.9,000.00 (by the way I use only two radiating room heaters, one refrigerator, one freezer, a TV, one washing machine, a water boiler, a rice cooker and home lighting - and NOT A SINGLE GEYSER). In certain sections of the Bhutanese society, this sum is enough to feed a family of twelve, for over two moths - with ease. This is truly appalling. Even worst, it has been announced that electricity tariff will be increased even further, as of this month. We, more accurately, the government and the big time thinkers and planners should hang their heads in shame - that we boast of being a big time producer of hydro-electricity and yet, electricity as a energy source is being priced out of the reach of the common people. The world of the Bhutanese has gone a little quirky. We say we produce so much electricity and yet, we cannot afford it. Infact, in some months we have to import electricity from India. We say we have 80% forest coverage and yet, the wildlife who has 4 times bigger land holding finds it necessary to invade the fields of the poor farmers who have only 20% share of the country’s land. In other parts of the world, humans encroach into wildlife habitat - in Bhutan the reverse is true. And yet we have rampant wildlife predation. Something is not quite right here. We recognize that large-scale incidences of Goongtongs is a serious problem with long term consequences on the country, and yet, we do nothing to amend the antiquated laws that cause it. The planners and thinkers are clueless of the reverse multiplier effect that Goongtongs will have on the country, over the long haul. Increasingly, large swaths of traditional farm lands are converted into cardamom fields and hazelnut plantations, severely impacting food production. We forget that it was the unchecked cardamom plantations that caused the governemnt to implement the country's first nationalization drive in the late 1970's. I am told that the hazelnut project is now in direct conflict with the country's "organics only" farming aspirations. We say we are champions of environmental conservation, and yet, we think nothing of scarring the landscape for hundreds of miles; dig roads that we do not need, and indiscriminately fell trees that have taken centuries to grow and mature. There is an urgent need to introspect and realize that we have become a society that is incapable of putting our minds and hearts into what we are doing. Our hearts do not seem to be where our minds are. We are glib talkers - but there seem little understanding that talk has to be followed through with action. We talk simply because there is a need for talk - some do not even understand what they are talking. One has to wonder how long we can go on like this.